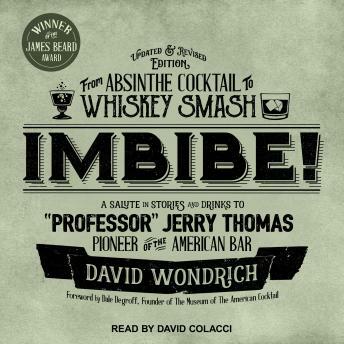 Cocktail writer and historian David Wondrich presents the colorful, little-known history of classic American drinks-and the ultimate mixologist's guide-in this engaging homage to Jerry Thomas, father of the American bar. The first edition, published in 2007, won a James Beard Award. Now updated with newly discovered recipes and historical information, this updated edition includes the origins of the first American drink, the Mint Julep (which Wondrich places before the American Revolution), and those of the Cocktail itself. It also provides more detail about nineteenth-century spirits, many new and colorful anecdotes and details about Thomas's life, and a number of particularly notable, delicious, and influential cocktails not covered in the original edition, rounding out the picture of pre-Prohibition tippling. This colorful and good-humored volume is a must-listen for anyone who appreciates the timeless appeal of a well-made drink-and the uniquely American history behind it.